I love the juice so much that I struggle to keep up with uses for the fleshy meat inside. Some of my favorite uses for the coconut meat are as noodles for raw Pad Thai, coconut ceviché, dairy-free whipped cream (YUM! ), and I even use them to make coconut wraps, both sweet and savory. I digress. I could go on and on about young coconuts. Obsess much? The important thing here is that you keep all ten of your highly useful digits AND enjoy young coconuts as often as you’d like. Stop the needless and highly unsafe whacking like an ax murder and watch the video below for a safe way to open young coconuts. 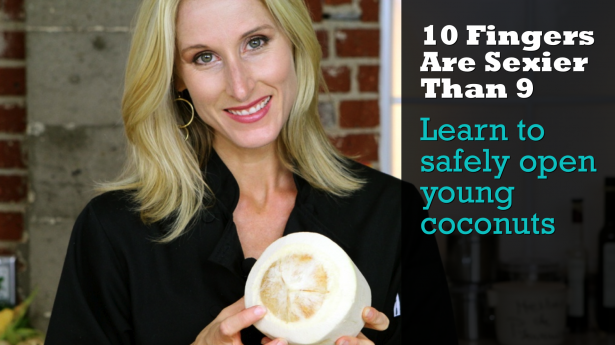 What is your favorite young coconut recipe? As I mentioned, I drink so much young coconut water that I am always on the look out for yummy recipes for the meat. Post your favorites in the comments below. The winning recipe will receive a FREE membership to my two week raw food cleanse, Rocking Body Raw Food. Thank you! haha….you must have been thinking of me when you made this. That was just to easy, thanks Joy. Whew, glad you got the hint. Speaking of keeping your 10 fingers in good shape, how ’bout we plan a visit to Princess Salon! Maybe take Evie & Bianca when she gets home. Like old times! would have loved to know what kind of knife you used!!! names? company and knife? size, if applicable?